Sometimes, after a great deal of use or after a long time of being in circulation, everyday coins get worn and corroded. However, you do not have to carry these weathered coins around with you -- you can clean your coins by soaking them in a mixture of common white vinegar and salt. The only difficulty in this coin-cleaning process is that it can be time consuming since really dirty coins might have to soak for more than an hour. Rinse the coins you want to clean in regular hot water by holding them by their edges (between your thumb and forefinger). Set your coins on a dry cotton cloth after they have been rinsed. Put the white vinegar into one of your plastic or glass containers, and then add in the salt. 1/4 cup of vinegar and 1 tsp. of salt should be enough for washing 3-5 coins at a time. Mix the salt into the vinegar until it has almost entirely dissolved. Tie your coins to a pencil or pen using string so they are hanging from the pen's or pencil's middle. Do this if you want an easy way to remove your coin after it has soaked. Place your coins into the vinegar and salt mixture. If you have tied them to a pen or pencil, place this pen or pencil across the top of your container so your coins hang in the solution. Let your coins soak. If they are just slightly dirty, then leave them in for 10 minutes. If your coins are entirely covered in corrosion, let them soak for at least 1/2 hour to an hour. Remove your coins from the cleaning solution and rinse them in distilled water. Put some distilled water into a different plastic or glass container. Hold each coin along its edge between your thumb and forefinger as you shake it under the surface of the distilled water. Place the coins onto the dry cotton cloth again so they can air dry. Alternatively, if you aren't concerned about scratches on your coins then feel free to rub them dry with the cloth. When soaking your coins, make sure each coin is not touching any of the other coins you have soaking. 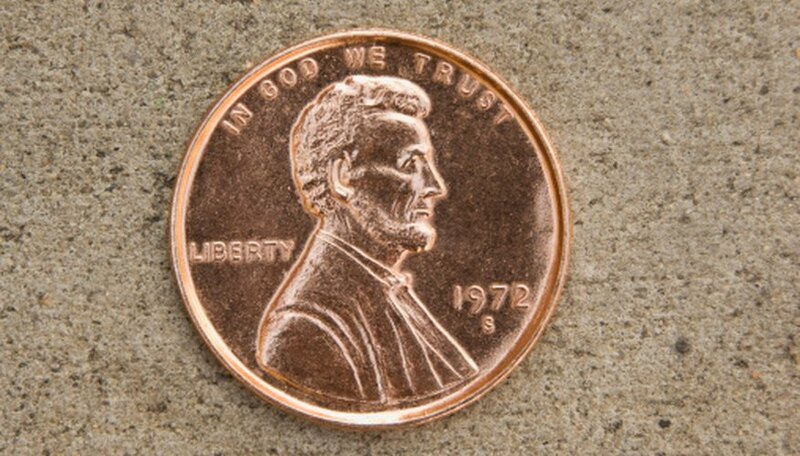 If coins that are touching are left to soak, chemicals from the coins themselves could disrupt the cleaning process. 1/4 cup of vinegar and 1 tsp. of salt are just guidelines for the cleaning solution. What is important is that the bottom of your container is covered in the solution so any coins you put in it can be completely submerged. Soaking multiple coins at a time is a good way to save time (and vinegar and salt), but for the best possible outcome try soaking each coin that you want to clean on its own. If you are cleaning multiple coins at a time, they may need to soak for longer than 10-30 minutes. The more coins you have sitting in your solution, the more the cleaning power of that solution is divided; more coins will most likely mean more time will be required for them to be fully cleaned. Be sure to check whether or not your coin has any value among collectors before cleaning it. Cleaning a coin without the aid of a professional will almost always result in its being damaged at least in a minimal way. Do not soak different kinds of coins at the same time. Different denominations of coins are made of different metals, and while they are soaking in the cleaning solution these different metals may react to each other with negative effects.